Bharat first look poster: Bharat starring Salman Khan and Katrina Kaif is one of the most awaited films of 2019. As the first look poster of Salman Khan from Bharat continues to garner praises, unseen photos of the actor from the sets has gone viral on social media. Bharat is scheduled to hit the silver screens on the occasion of Eid, i.e June 5. Bharat first look poster: Bollywood actor Salman Khan is all set to deliver another blockbuster with his next release Bharat. From the star-cast to the theme of the film, it seems like the makers are leaving the opportunity to tick all the right boxes. With less than 10 days to the trailer launch, the first look poster of Salman Khan as Bharat was released today dating to the year 2010. As the fans continue to go gaga over his swag and the depth in his eyes, the behind-the-scenes photos from the sets has gone viral on social media. The photos are originally shared by Salman’s co-star Bina Kak. In the photos, Salman is seen sporting the same grey hair and white-bearded look with intense expressions and deep eyes. Sharing the photos on her Instagram account, Bina Kak wrote that since the first look is finally out, she can now share the photos she clicked in Delhi. 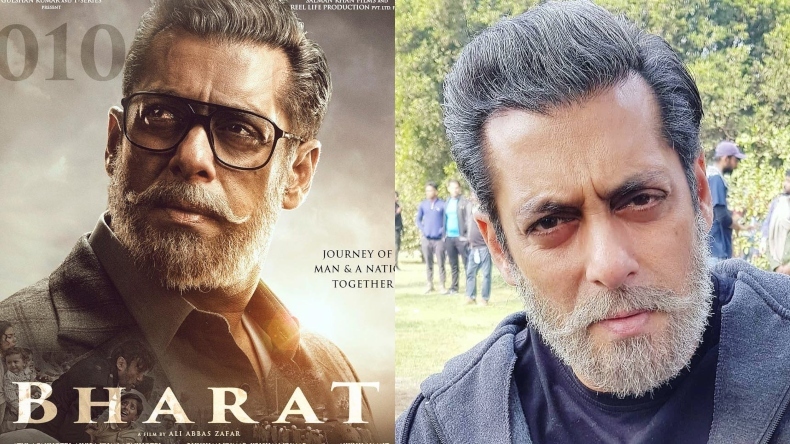 Sharing the first look poster of Bharat, Salman introduced himself as a man with white hair and beard but a colourful personality. Shared just a few hours ago, the poster has already crossed 1 million likes on Salman’s profile. The teaser of Bharat was released in the month of February and has already garnered more than 41 million views. Helmed by Ali Abbas Zafar and bankrolled by Salman Khan under the banner of Salman Khan Films and T-Series, Bharat is slated to hit the silver screens on the occassion of Eid, i.e June 5. Along with Salman Khan, the film also stars Katrina Kaif, Disha Patani, Nora Fatehi, Sunil Grover, Jackie Shroff in key roles. An official adapation of Korean film An Ode To My Father, Bharat is the story of a man and a nation together. Bharat marks the third collaboration of filmmaker Ali Abbas Zafar and Katrina Kaif together.